If you’re anything like me, you may be thinking “what is Banoffee Pie anyways?” Well, until today I didn’t really know either – but have since learned that it is a yummy creamy pie made of bananas, dulce de leche (which is sweetened milk) and whipped cream in a graham wafer crust. It’s particularly popular in Britain and is a very rich and sweet dessert. Sounds pretty complicated, right? It’s not! Here’s how it’s done! 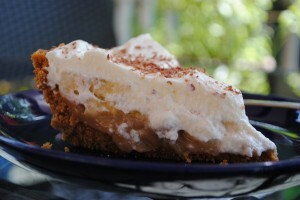 Combine graham crumbs, melted butter, sugar and ginger, and press into a large pie plate, and chill. Boil the can of sweetened condensed milk in a pan of water for between 2 and 3 hours. Open carefully once it’s thickened and turned brown. Whisk together to make sure there are no lumps and pour into pie crust. Top with banana slices and then whipped cream with the sugar added to it. If you like, you can add chocolate shavings on the top to make it extra pretty. Do you mean that you place the can of milk in a pan filled with water? Lid is off can I presume? You will need to pierce the can on the top (but leave the top on) and yes, boil the entire can :o) It makes dulce de leche!